This article describes data types supported in Power BI Desktop and Data Analysis Expressions (DAX). When you load data into Power BI Desktop, it will attempt to convert the data type of the source column into a data type that better supports more efficient storage, calculations, and data visualization. For example, if a column of values you import from Excel has no fractional values, Power BI Desktop will convert the entire column of data to a Whole Number data type, which is better suited for storing integers. This concept is important because some DAX functions have special data type requirements. While in many cases DAX will implicitly convert a data type for you, there are some cases where it will not. For instance, if a DAX function requires a Date data type and the data type for your column is Text, the DAX function will not work correctly. So, it’s both important and useful to get the correct data type for a column. Implicit conversions are described later in this article. The Data Type drop down in Query Editor has two data types not currently present in Data or Report View: Date/Time/Timezone and Duration. When a column with these data types is loaded into the model and viewed in Data or Report view, a column with a Date/Time/Timezone data type will be converted into a Date/Time, and a column with a Duration data type is converted into a Decimal Number. Decimal Number – Represents a 64 bit (eight-byte) floating point number. It’s the most common number type and corresponds to numbers as you usually think of them. Although designed to handle numbers with fractional values, it also handles whole numbers. The Decimal Number type can handle negative values from -1.79E +308 through -2.23E -308, 0, and positive values from 2.23E -308 through 1.79E + 308. For example, numbers like 34, 34.01, and 34.000367063 are valid decimal numbers. The largest value that can be represented in a Decimal Number type is 15 digits long. The decimal separator can occur anywhere in the number. The Decimal Number type corresponds to how Excel stores its numbers. Fixed Decimal Number – Has a fixed location for the decimal separator. The decimal separator always has four digits to its right and allows for 19 digits of significance. The largest value it can represent is 922,337,203,685,477.5807 (positive or negative). The Fixed Decimal Number type is useful in cases where rounding might introduce errors. When you work with many numbers that have small fractional values, they can sometimes accumulate and force a number to be slightly off. Since the values past the four digits to the right of decimal separator are truncated, the Fixed Decimal type can help you avoid these kinds of errors. If you’re familiar with SQL Server, this data type corresponds to SQL Server’s Decimal (19,4), or the Currency Data type in Power Pivot. Whole Number – Represents a 64 bit (eight-byte) integer value. Because it’s an integer, it has no digits to the right of the decimal place. It allows for 19 digits; positive or negative whole numbers between -9,223,372,036,854,775,808 (-2^63) and 9,223,372,036,854,775,807 (2^63-1). It can represent the largest possible number of the various numeric data types. As with the Fixed Decimal type, the Whole Number type can be useful in cases where you need to control rounding. 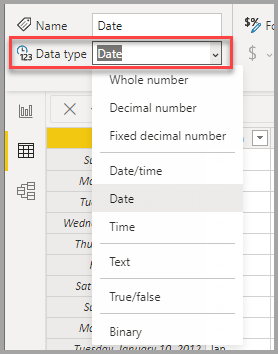 Power BI Desktop supports five Date/Time data types in Query View and three in the Report View and model. Both Date/Time/Timezone and Duration are converted during load into the model. Date/Time – Represents both a date and time value. Underneath the covers, the Date/Time value is stored as a Decimal Number Type. So you can actually convert between the two. The time portion of a date is stored as a fraction to whole multiples of 1/300 seconds (3.33 ms). Dates between years 1900 and 9999 are supported. Date – Represents just a Date (no time portion). When converted into the model, a Date is the same as a Date/Time value with zero for the fractional value. Time – Represents just Time (no Date portion). When converted into the model, a Time value is the same as a Date/Time value with no digits to the left of the decimal place. Date/Time/Timezone – Represents a UTC Date/Time. Currently, it’s converted into Date/Time when loaded into the model. Duration – Represents a length of time. It’s converted into a Decimal Number Type when loaded into the model. 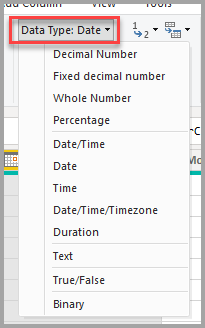 As a Decimal Number type it can be added or subtracted from a Date/Time field with correct results. As a Decimal Number type, you can easily use it in visualizations that show magnitude. Text - A Unicode character data string. Can be strings, numbers, or dates represented in a text format. Maximum string length is 268,435,456 Unicode characters (256 mega characters) or 536,870,912 bytes. True/False – A Boolean value of either a True or False. Blank - Is a data type in DAX that represents and replaces SQL nulls. You can create a blank by using the BLANK function, and test for blanks by using the ISBLANK logical function. DAX uses a table data type in many functions, such as aggregations and time intelligence calculations. Some functions require a reference to a table; other functions return a table that can then be used as input to other functions. In some functions that require a table as input, you can specify an expression that evaluates to a table; for some functions, a reference to a base table is required. For information about the requirements of specific functions, see DAX Function Reference. Each DAX function has specific requirements as to the types of data that are used as inputs and outputs. For example, some functions require integers for some arguments and dates for others; other functions require text or tables. You can type a date as a string, and DAX will parse the string and attempt to cast it as one of the Windows date and time formats. You can add TRUE + 1 and get the result 2, because TRUE is implicitly converted to the number 1 and the operation 1+1 is performed. If you add values in two columns, and one value happens to be represented as text ("12") and the other as a number (12), DAX implicitly converts the string to a number and then does the addition for a numeric result. The following expression returns 44: = "22" + 22. If you attempt to concatenate two numbers, Excel will present them as strings and then concatenate. The following expression returns "1234": = 12 & 34. The type of conversion that is performed is determined by the operator, which casts the values it requires before performing the requested operation. These tables list the operators, and indicate the conversion that is performed on each data type in the column when it is paired with the data type in the intersecting row. Text data types are not included in these tables. When a number is represented as in a text format, in some cases Power BI will attempt to determine the number type and represent it as a number. For example, if a real number is used in an addition operation in combination with currency data, both values are converted to REAL, and the result is returned as REAL. In the following table, the row header is the minuend (left side) and the column header is the subtrahend (right side). For example, if a date is used in a subtraction operation with any other data type, both values are converted to dates, and the return value is also a date. Data models also support the unary operator, - (negative), but this operator does not change the data type of the operand. For example, if an integer is combined with a real number in a multiplication operation, both numbers are converted to real numbers, and the return value is also REAL. In the following table, the row header is the numerator and the column header is the denominator. For example, if an integer is combined with a currency value in a division operation, both values are converted to real numbers, and the result is also a real number. In comparison expressions, Boolean values are considered greater than string values and string values are considered greater than numeric or date/time values; numbers and date/time values are considered to have the same rank. No implicit conversions are performed for Boolean or string values; BLANK or a blank value is converted to 0/""/false depending on the data type of the other compared value. =IF(FALSE()>"true","Expression is true", "Expression is false"), returns "Expression is true"
=IF("12">12,"Expression is true", "Expression is false"), returns "Expression is true"
=IF("12"=12,"Expression is true", "Expression is false"), returns "Expression is false"
In DAX, a null, blank value, empty cell, or a missing value is all represented by the same new value type, a BLANK. You can also generate blanks by using the BLANK function, or test for blanks by using the ISBLANK function. How blanks are handled in operations such as addition or concatenation depends on the individual function. The following table summarizes the differences between DAX and Microsoft Excel formulas, in the way that blanks are handled.